Synagis® muscular injections can help high-risk infants avoid serious complications from respiratory syncytial virus (RSV). Dr. Schochet and Dr. Lie discuss the symptoms, transmission, and prevention of RSV. Synagis® (palivizumab) for infants is an FDA-approved prescription, made up of virus-fighting antibodies, which helps prevent serious respiratory tract infections caused by respiratory syncytial virus (RSV). While Synagis® is not a vaccine, it can help high-risk infants by protecting them from severe RSV disease. Synagis® is given as a series of injections, typically in the thigh muscle, which should begin prior to RSV season, before the virus is active, and continuing every 28-30 days for the duration of the RSV season. RSV season typically begins in the fall and continues through winter and spring in most areas of the U.S.
Synagis® can give protection to the vulnerable lungs of premature or low birth-weight babies by providing the infection-fighting antibodies needed. For optimal protection, high-risk infants should receive the Synagis® injections on time every month during the RSV season, as each dose gives approximately 1 month of protection. While Synagis® does not completely eliminate the risk of RSV, even a child who gets an RSV infection after the first dose should continue monthly injections to help prevent new RSV infections. If your child exhibits severe allergic reaction symptoms after receiving Synagis®, you should contact your doctor or seek medical help immediately. Any child who has had a severe allergic reaction to Synagis® should not receive further injections. Synagis® is not a treatment for RSV, but rather a preventative measure as protection against serious complications from RSV. The American Academy of Pediatrics (AAP) recommends palivizumab be administered to high-risk infants who are likely to benefit from the injection treatments. The CDC (Centers for Disease Control and Prevention) posts information for healthcare professionals regarding palivizumab prophylaxis among infants and young children at increased risk of hospitalization for RSV infection. 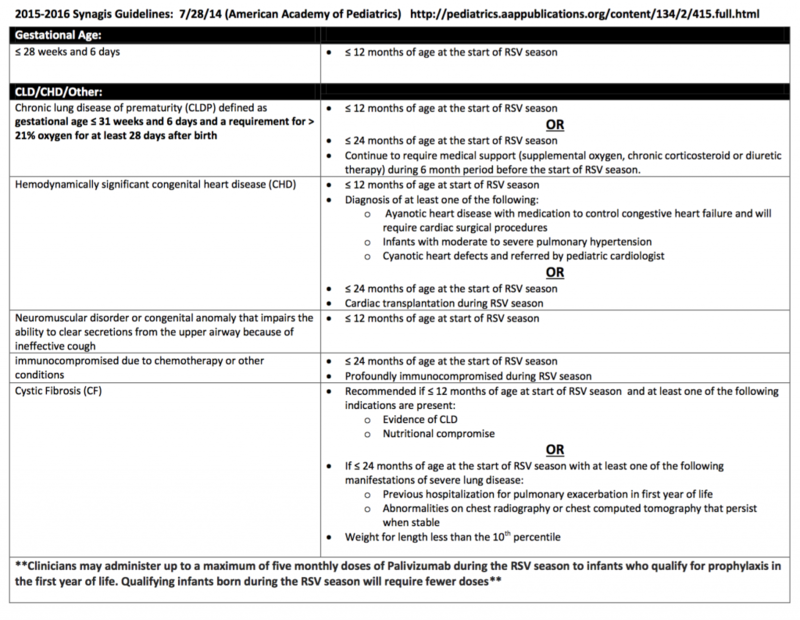 They state that on July 28, 2014, AAP released updated guidance for palivizumab prophylaxis among infants and young children at increased risk of hospitalization for RSV infection. For specific and latest palivizumab guidance, please consult the AAP policy statement. An accompanying AAP technical report provides additional context and rationale for the guidance. If you child or infant is at high-risk for RSV, contact Dr. Schochet or Dr. Lie about monthly Synagis® muscular injections. 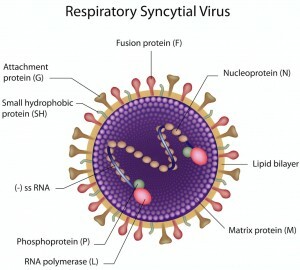 Respiratory syncytial virus (RSV) is a highly contagious and common respiratory virus that infects the breathing passages and lungs. Most children have had RSV by the age of 2, with nothing more than cold-like symptoms. 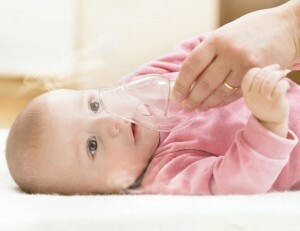 For high-risk infants and children, however, RSV can cause serious health problems that can result in hospitalization. Symptoms of RSV can range from mild to life-threatening, depending on the general health of the child. Symptoms typically appear within 4-6 days of exposure to RSV, and usually present as a cold-like illness at the onset, but can quickly cause various respiratory problems. Approximately 57,000 children under age 5 are hospitalized each year in the U.S. due to RSV. Hospitalization for RSV usually lasts for a few days with a full recovery within 2 weeks after release. RSV is highly contagious, being transmitted through direct or indirect contact with someone who is infected, or through virus-containing droplets that enter the air after the infected person sneezes or coughs. RSV is frequently contracted at a school or daycare environment, where children come in contact with surfaces, such as doorknobs and tabletops, which have been touched by an infected person. RSV nasal and oral secretions can be transferred and remain on hard surfaces for many hours, and soft surfaces, such as hands and tissues, for shorter time periods. For infants and children at high-risk for RSV, monthly intramuscular injections of Synagis® (palivizumab) are available during the RSV season to help prevent respiratory infections brought on by severe RSV. 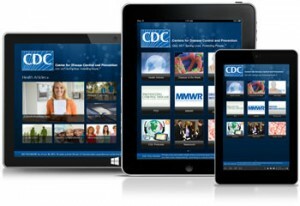 Download the CDC’s mobile app “Disease of the Week” and find RSV. If your child is exhibiting signs of RSV, or is at high-risk for contracting RSV, please call our office for an appointment. 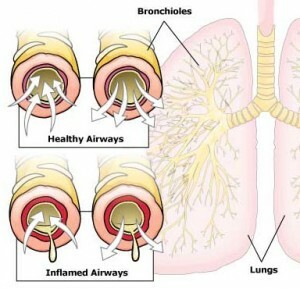 For more information about pediatric respiratory disease please submit an online appointment request or contact the office of Dr. Peter Schochet and Dr. Hauw Lie at 972-981-3251.